In the middle of the night, an 8-inch bundle of feathers and hollow bones projects a haunting, mysterious sound. It sounds like the rising and falling whinny of a horse, followed by a piercing tremolo. Though it sounds far away, the bird—an eastern screech-owl—could likely be right above your head (that is, if you are out in the middle of the woods at night). A year-round, common resident of northern Illinois, the eastern screech-owl, (Megascops asio) is primarily found in woodlands; it prefers trees with natural cavities near a field with a stream or shallow river. But it can also be found in wooded residential neighborhoods, possibly even in your backyard. It could be lurking in a small tree cavity during the day, snoozing while waiting for its evening foray to your back porch light to catch a moth. The eastern screech-owl comes in two color morphs—red (rufous) and gray. Ornithologists aren’t sure why, but they do know parent morphs of the same or different colors can producer young of either color. Those who get a look at this owl under moonlight or in its daytime roosting hole will see a dark streaking on the owl’s breast that blends well with the tree’s bark. It has a 20-inch wingspan, piercing yellow eyes, and tiny ear tufts. (Actually, these are not ears, but rather feather tufts it can move to communicate or use for camouflage.) As with most owls, the ears of the eastern screech-owl are situated asymmetrically on either side of its head—one is higher than the other. This arrangement enables it to zero in on its prey through triangulation, by turning its head to the left and right and moving it up and down a few times. The Chicago Botanic Garden regularly holds programs offering visitors a chance to learn about the habits of Illinois owls as well as hear and see the diminutive eastern screech-owl. Join us for our next Owl Prowl sessions. These owls will nest in a natural cavity or man-made nest box, adding no material of their own. The female lays four to five white, round eggs and incubates them for about 26 days. The male brings her food when she’s on the eggs and also after they hatch. She breaks up the prey into morsels to feed her young. In another 26 to 30 days, the young fledge, but they remain dependent on the parents for food for a few months longer before heading out on their own to hunt. What do they hunt? An eclectic diet: eastern screech-owls eat moles, mice, shrews, and flying squirrels year-round, but also prey on cicadas, crickets, moths, and worms during warmer months. Like other owls, the screech-owl regurgitates pellets that contain undigestible fur and bones. Finding pellets beneath a tree is one clue to its presence. You can purchase screech-owl boxes and hang them in a tree in your wooded backyard with hopes of attracting them to nest. 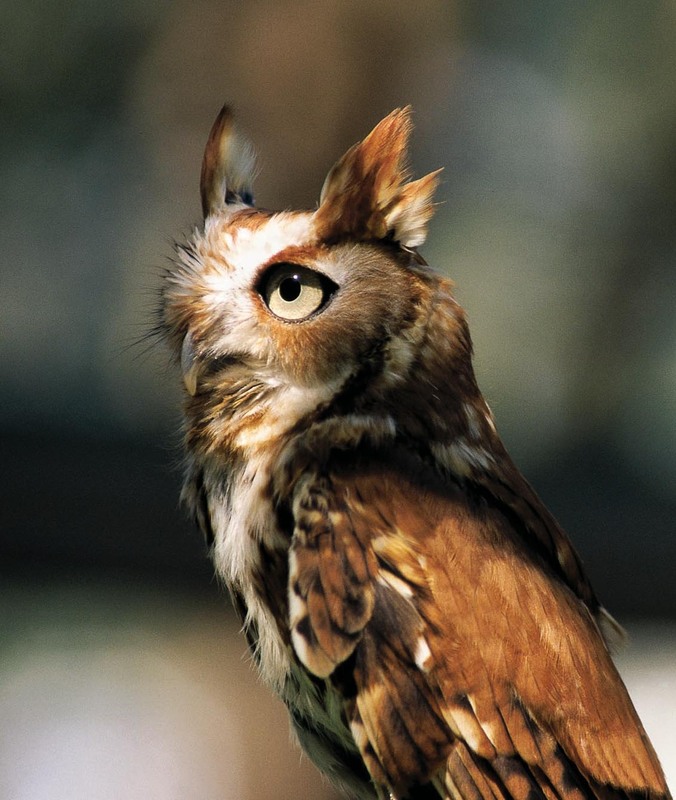 At night, listen for the mysterious whinny of the screech-owl near a woodland. You never know how close one may be. 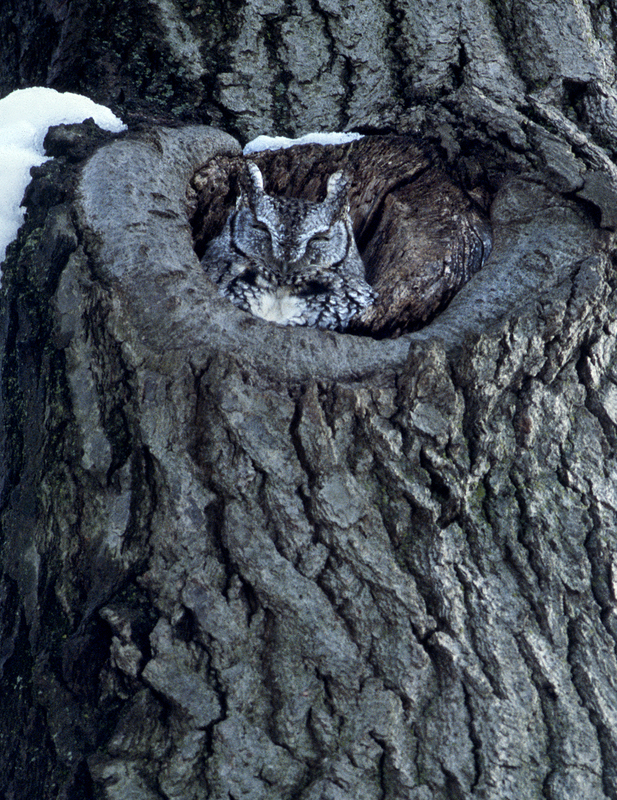 Or on a sunny day, especially in winter, look at natural cavities and trees—you might see a screech-owl snoozing at the entrance. The eastern screech-owl is the October bird species highlighted by the Forest Preserves of Cook County. Come #birdthepreserves with the FPDCC; view the list of upcoming events for free events near you.